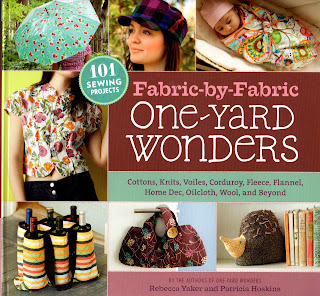 Fabric by Fabric One Yard Wonders - 101 Sewing Projects Using Cottons, Knits, Violes, Corduroy, Fleece, Flannel, Home Dec, Oilcloth, Wool and Beyond by Rebecca Yaker and Patricia Hoskins is a compilation of projects that can be sewn using one single yard of fabric. It's spiral bound in a hard cover with box attached on the inside cover which holds pattern pieces. Some of the pattern pieces for some of the projects you'll draft by hand. Those have simple shapes and measurements. The nice thing about one yard patterns is that it's a great way to use a yard of great fabric. It starts with a basic introduction to the supplies you'll need, and most of the projects are done using just a straight stitch on a standard sewing machine. The projects are separated by fabric type. So whatever your favorite fabric type is, there is a project for it. The projects collected are wonderful, there is a lot of variation. Many very cute purses and bags, but also skirts, tops, hats, organizers, home decorating, and accessories. The projects covers a lot of skill levels with clear instructions so if you haven't tried a technique before like ruffling, smocking, pleating or placing zippers, you should be able to follow the instructions to do so. While there are a lot of projects meant for children, there are also several clothing patterns for adults. My daughter likes the Urban Wabbit Hunting Cap best, my favorite pattern is the quilter airliner bag with it's retro feel and decorative quilt stitching. There are also patterns for adult shirts, skirts, lots of children's clothes and toys. 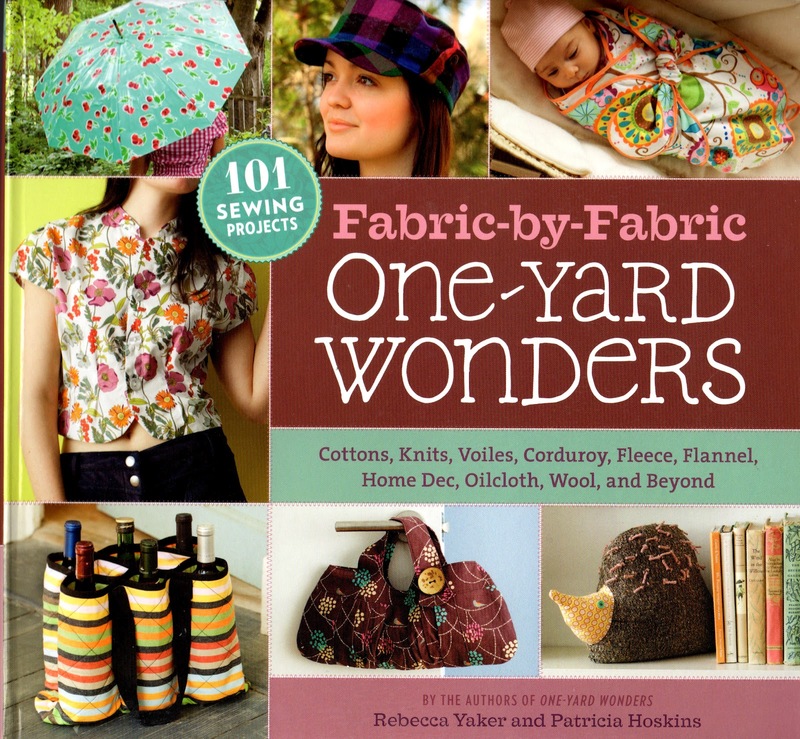 If you like sewing, and have a stash of fabrics you couldn't resist buying just one yard, or if you're a sewer with a lot for quickly finished projects, you'll enjoy the variety available in here. A lot of the projects can also be done with creative cutting from thrifted items or from items in your own closet. Published by Storey Publishing. You can pick this up from your local bookstore, or by using the Amazon.com affiliate links below.For U.K. readers- apparently the instructions in the U.K. version do have inch measurements instead of metric. I have this book and I love it! All the projects I've tried from it have turned out great! Lots of great pictures and easy to follow instructions. I recommend it!